Windsor, ON: No one should go hungry. 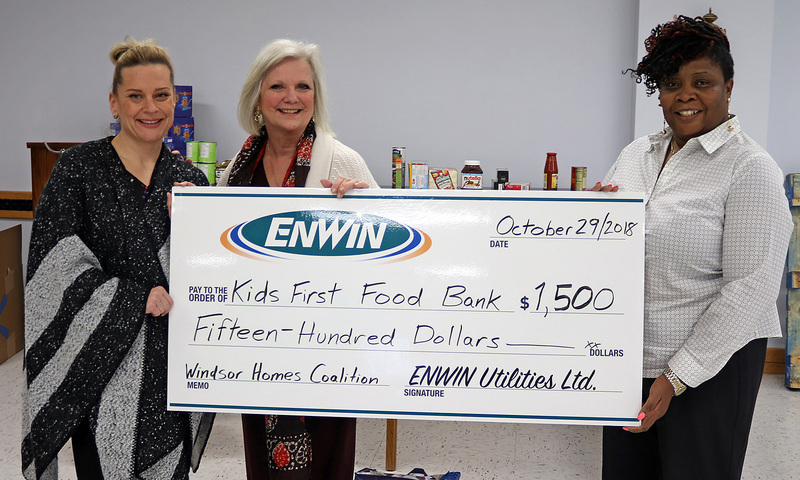 That's the message ENWIN delivered to the Kids First Food Bank at the Windsor Homes Coalition, which was forced to close last week, due to an unprecedented level of need. ENWIN staff were quick to react upon learning of the food bank's closure, and immediately rallied around the suggestion of a food drive. In just 48 hours, employees gathered at least $400 in food -- enough to fill a pick-up truck -- along with $550 in cash, for a total donation worth $950. ENWIN responded with a matching contribution of $950 from our Grass Roots Community Support fund, raising the cash portion of the donation to $1,500. This morning, Angela Yakonich, Executive Director of the Windsor Homes Coalition accepted a cheque for $1,500 from the utility. "To say we are humbled by the support and generosity of individuals and companies like ENWIN from across Windsor-Essex would be an understatement," said Angela Yakonich, Executive Director of Windsor Homes Coalition Inc. "We are beyond appreciative for the community support we have received since our closure last Monday." ENWIN Planner/Scheduler Walter Argent, who suggested the initiative, agrees. "When you hear about a food bank closing its doors, it is a significant problem for the people who rely on that service," he said. "As they always do, our staff responded. Donations began to gather before we even had a drop-off area selected! That shows how much our people care." "I am continuously impressed by the spirit and generosity of our employees," she added. "It is an honour and pleasure to work with such caring individuals. Our sincere thanks to those who rallied around Walt to support this effort." This impromptu event was a clear indication that ENWIN employees are gearing up for holiday season fundraising and volunteering, such as the Let's CAN Hunger Together campaign, launched last week in partnership with Essex Powerlines.